If you’ve been reading up ’til now, you know I’m in the middle of a big project. I’m making over 200 cakepops for a very special birthday party and while I’m super excited to be doing this, it’s also presented me with some pretty interesting challenges. 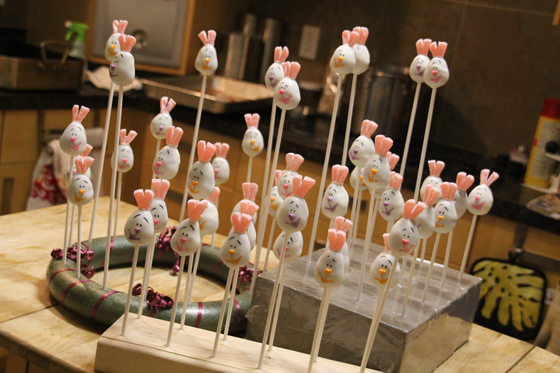 When Mom and I ran our teashop, one of the specialty confections we served and sold were our house-made cakepops. I’d usually make them a half a batch at a time, which was about 30. I had my process down to a science, almost, and I got really good at making these adorable cupcake shaped ones. I even helped Nick make them at the store once! Anyway, like I said, I’d usually make them a half batch at a time, which was about 30 or so. When I was first teaching myself how to make cakepops, I read that Styrofoam blocks would make good holders for the cakepops. I bought a round Styrofoam form that’s usually used to make wreaths for my first cakepop holder. 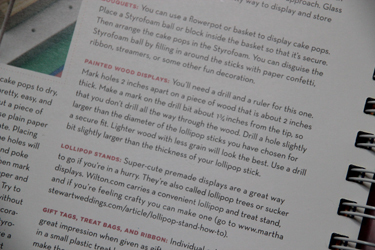 With the Styrofoam, you simply push the pop stick down into the foam, and a hole the right size is created. That first holder held 16 cakepops, and it worked well for a while, but I realized that with use, the holes in the Styrofoam would get bigger, and eventually the pops wouldn’t stand completely vertical anymore – sometimes they’d wobble in their slots, which meant that as I placed pops in there that were drying, I’d have to stagger them in the holder so they didn’t accidentally touch each other and smear. When we started making more of them at the store, I had to make another holder, and this time I bought a block of florist foam. 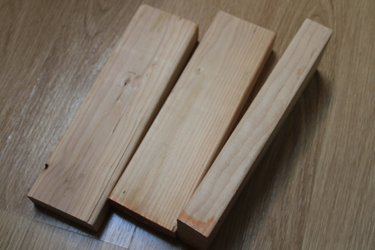 This block was larger, so I’d be able to push the pop sticks deeper into the block, making sure they’d stay vertical. The florist foam worked better in that sense, but because of the material it was made of, I’d almost always get florist foam dust on the bottoms of the cakepop sticks that I’d have to wipe off to make sure people didn’t get green dust on their cakepops. 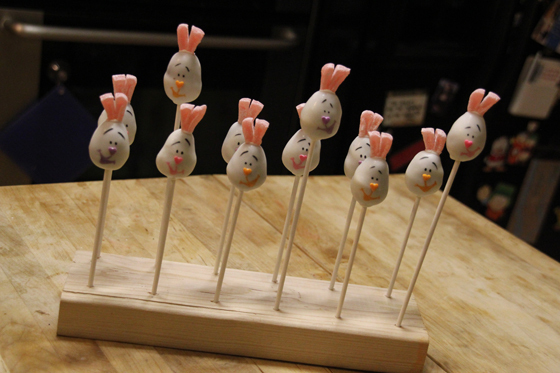 For this project, I realized it would make things a whole lot easier if I had a few more cakepop holders, and I figured since I’d tried the other two mediums, that maybe it was time to get serious and make myself a wooden cakepop holder. 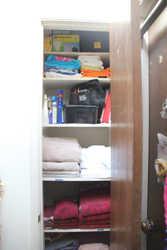 You may have read my post from earlier this year about organizing our linen closet. I cannot tell you how much I love being able to just go to a spot somewhere in the house where you know where everything goes and it’s orderly, neat, and accessible. I love that closet. I haven’t made much headway in getting the rest of the house like that, unfortunately. 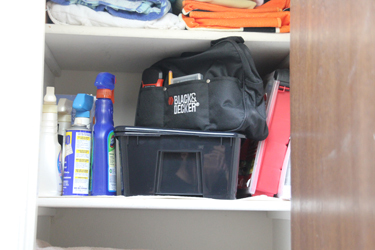 Anyway, one of the things I like about that closet being so organized now is that my tool bag is there, at arm’s reach, with things like a hammer, tape measure, pencil, and my favorite, my drill/electric screwdriver (that I actually bought separately – it’s a bit more high-powered than the plain electric screwdriver I had before). 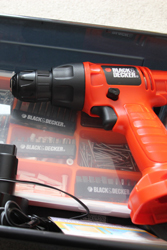 We don’t have a heavy duty drill in our place – we don’t need one – we do have one downstairs in the garage somewhere, but for the most part, we just need a basic one that we can use mainly for its electric screwdriver function, and for drilling a few holes here and there when an odd project needs it (like installing curtains!). I knew it would suffice for this little project. 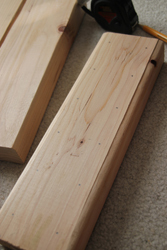 I actually also remembered that we had a few scrap pieces of 2×4 downstairs in the garage. I wouldn’t even have to go buy wood for this! Score! I gathered my materials. I got the instructions for this project from my “Cake Pops” book, and they said I needed to place the holes a certain distance apart, and from the sides of the block. 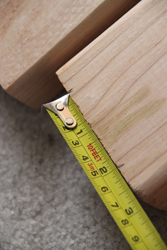 I started measuring. 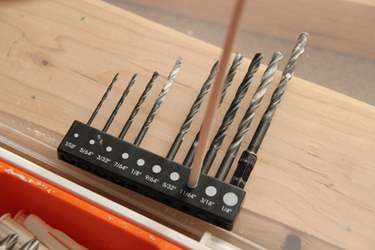 After I had the spots for all my holes measured out, I needed to find out what size drill bit to use. 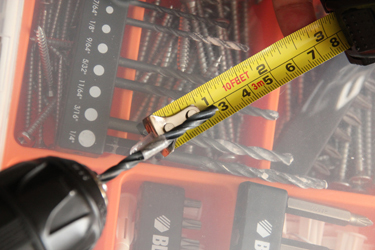 I took a pop stick and found the corresponding sized drill bit by comparing the pop stick to the sizes on the side of the bit holder. I wanted the holes to be a little bit larger than the pop sticks, but not too large. 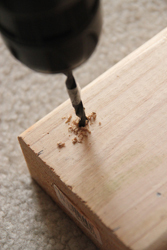 I also didn’t want to drill straight through the blocks, so I measured off an inch of the drill bit and put a piece of tape at that spot so I’d know where to stop drilling each hole. Then, I went to town! 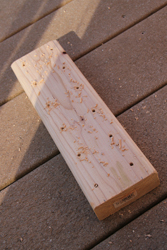 I drilled all the holes and voila! 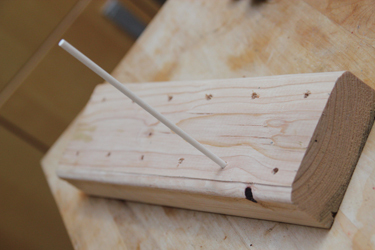 A wooden cakepop holder. Thank goodness. I need these. And here’s a shot of all of my different kinds of holders in action … I told you, I’m making a tiny, delicious army.